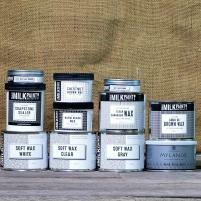 Caribbean Blue Milk Paint | The Real Milk Paint Co.
Our non-toxic blue paint will infuse your home with serenity and float you off into blissful tranquility. Imagine the Caribbean breeze fluttering on your face as the vibrancy of Caribbean Blue Milk Paint delights your sight. Caribbean Blue Milk Paint is made with purified milk protein, calcium lime, natural pigmentation, and a plant-based filler to give you a rich pop of color. The calcium lime ingredient goes through a process known as carbonization, meaning it absorbs carbon dioxide in the air. When used indoors, Milk Paint reduces carbon emissions that contribute to global warming, purifies the air in your home and emits the authentic feeling of a Caribbean haven for your eyes and your lungs. By adding water to our non-toxic, environmentally-friendly paint powder, Milk Paint can be applied to plaster, wood, drywall, stone or unsealed brick and concrete. The consistency is up to you. For a thicker paint, add one-part water to one-part powder. For more of a wash coat, add extra water until the product matches your desired density. The artist in you can even mix paint powders so your project meets your vision. Packaged in a plastic recycled can with a marble for mixing, the contents remain usable for a minimum of two weeks after water is added. In addition to its long lifespan, Caribbean blue paint will not “blob” like other paints. Just do a little jive with the container and you can beautify floors, decks, walls, ceilings, furniture, pots and whatever else is pleading for a beautiful blue. With Milk Paint, the possibilities are endless.